On another pre-autumnal Saturday, Wizard and I took a trail ride with Kris and her Mustang mare Sunny. We rode the big loop in the opposite direction from the usual route, just to keep things different. We did some trotting. I cantered Wizard while Sunny did her big, ground-covering trot on the smooth cantering lane. Our trail ride was a little under an hour long. When we got back to the barn, I rode in the arena with a big group of riders in the outdoor arena. I mostly stood/walked and watched while they practiced their jumping, and then Wizard and I did some really simple canter work. 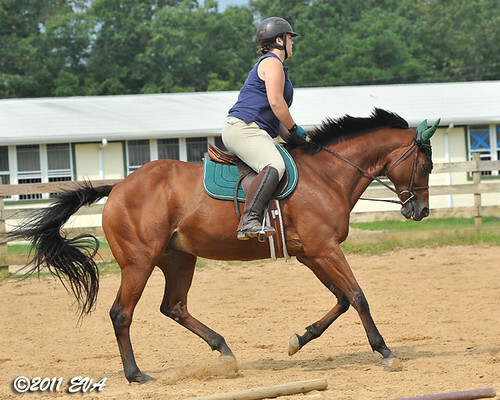 I found a new song that has the perfect tempo for cantering: Stevie Wonder’s “Superstition”. We cantered in each direction, doing big, loopy circles, and riding down the long sides. It was a really straightforward ride and we were just working on tempo and I worked on my position, getting in and out of my jumping position.